An afternoon of festive fun is to be unwrapped at Wellgate’s annual Christmas extravaganza! This Friday, 16th November, Wellgate will be transformed into a Winter wonderland with snow, local entertainers and, of course, the man himself, Santa. Lots of family-friendly, seasonal activities will also be available to enjoy, especially for our younger visitors. What’s more, with Dundee schools off for in-service day, there will be ample time for families to come down and enjoy the fun. 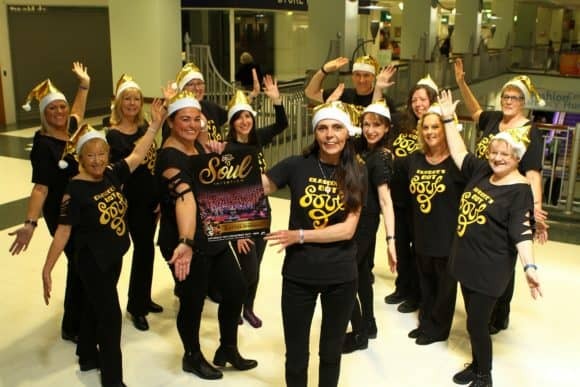 ‘Got Soul’ Choir will once again return to mark Wellgate’s Christmas countdown. With Santa officially kicking off the proceedings – as he should! – our fabulous grotto will be unveiled at 3pm, staying open every weekend and on Christmas Eve. Visitors will then be wowed by two hours of sensational, festive talent. With young dancers from Perth’s Julie Young School of Dancing, followed by roof-raising Dundee choir, Got Soul Choir, you can then enjoy performances from Dundee’s Showcase the Street streetdance and musical theatre group, and Ferry Dance School’s festive ballet dancers. Please come along and support these talented entertainers from in and around the city. The afternoon’s celebrations will draw to a close with a 45 minute show from Funbox, the perfect preview of their Christmas tour kicking off in Dundee the following week. Last, but certainly not least, Christmas would not be Christmas without the white stuff! As you might have guessed, we’ve saved the best for last with a guaranteed snowfall. A truly magical sight to see, bring your children along and watch them create snow angels on the ground floor. Our Christmas lights will then be switched on by Santa at 5pm, the perfect finale to what promises to be a brilliant, family-friendly afternoon. Of course, Christmas is also a time to remember those less fortunate so, once again, we will be inviting our shoppers to support local charities. There will be two Wishing Wells by Santa’s Grotto where you can make a donation to Maggie’s Centres and The ARCHIE Foundation. Maggie’s Centres offer free practical, emotional and social support to people with cancer and their families and friends. This will be a fantastic year-end boost to the charity, which Wellgate has already supported this year throughout the sponsorship and purchase of our beloved Maggie’s penguin, who you can pop up and visit on the top floor. The ARCHIE Foundation is a children’s charity with a family of funds, all different, but with the same aim – to make the difference to children’s healthcare. 5pm Lights switch-on, with snow falling!